In this modern world, most of the people giving their top priority on feeling secure and safe at their own home so taking measure in order to protect and safe against a burglar. When assessing your home security, you must consider certain things. If you are looking to provide high security to your home then you should follow some tips such as lock windows, lock your house door, think like a burglar, balcony door, spare key and garage door. The high quality of lock is one of the perfect ways to protect your home and it is always necessary that check whether the door is made of metal or solid wood. According to the studies says that swing lock is one of the best ways to secure your home and it is the easiest locks to install at our home. This kind of the lock acts as the backup to your home door primary lock. This lock allows you to open door few inches so that you can speak with whoever is on another side of the door. A portable lock like paddock could be easily installed and removed from your home door within a minute because drilling is not required. Numerous numbers of the locks are available to choose the lock which is easy to install. You can also get the help of locksmith technician because they are offering excellent guidance to choose the best lock to protect your home. You can choose residential locksmith service so that you can get plenty of services. If you are doing some research then you can choose the best lock according to your requirements. Spring latch lock is also called as the slip bolt lock but it can provide only minimal security. 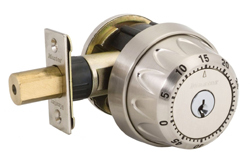 Two main types of the mechanical locks are available such as multipoint locks and deadbolts. At the same time, the multipoint lock might be broken into two types such as RIM and mortise. You can choose the home lock based on the door material, lock standards, functionality, and locks. If possible, you might select biometric or digital lock because it comes with excellent benefits like remotely controlled, being keyless and highly customizable or programmable.